Located along the Fort Lauderdale intercoastal waterways, Royale Palm Yacht Basin & Marina on South Florida east coast has been a family owned and operated marina since 1966. We are a proud member of the MIASF and have a reputation for being one of South Florida’s best marinas and service facilities. Within walking distance to Dania Beach Casino & Restaurants-Entertainment! Royale Palm Yacht Basin & South Florida Marina is located in Dania Beach at 2 miles from Port Everglades inlet with no fixed bridges. We welcome live aboard boaters whether power or sail. Our marina is able to handle vessels up to 80 feet in length with many of our berthing slips in the 40 ft. to 60 ft. range. We also provide a variety of services including boat painting and maintenance. See our marina facility features. Royale Palm marina only a few minutes drive to the beautiful Dania & Fort Lauderdale Beach and walking distance to Dania Beach casino! The Royale Palm Marina of South Florida in Dania is considered one of the best marinas in South Florida and offers world class service to yachtsman of many preferences. A big welcome is always given to live aboard boaters whether they be power or sail. Our quality full yachting service ranging from expert bottom painting to all major vessel repairs is available in short order at your request. We are proud to offer a wake-free marina with complete boat yard facilities. Click on our Gallery photos to see our beautiful marine facility with Blue Warm Florida Skies and Royal Palms. The Royale Palm Marina, in the Fort Lauderdale area, is well protected from bad weather and has deep water with easy access to the marina. 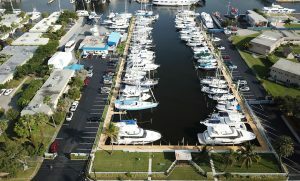 The ideal location of this marina, places it only minutes from many of South Florida world class chandlers and marine businesses offering various upgrades and repair parts. Hungry? Some South Florida’s finest restaurants and fast foods are also located within just a mile or two from your slip at The Royale Palm Marina. The Publix Supermarkets, one of Florida’s best, has many very handy locations nearby. The Fort Lauderdale Hollywood International Airport is just around the corner for easy airline travel to and from destinations all over the world. 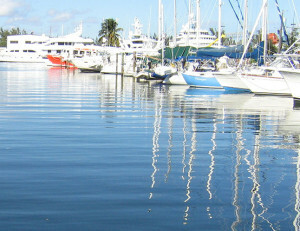 The Fort Lauderdale Boat Show, one of the largest boat shows in the world, is held near the marina at Fort Lauderdale Beach and the Broward Convention Center. Large international cruise ship fleet docks are also nearby. What about an exciting night at Dania Beach casino? You can arrive there just walking! If it is convenience and protection what you are looking for, please give us a call at 954-923-5900 or e-mail us and we’ll help you with your plans to visit our exciting marina in the Fort Lauderdale area. Awlgrip Yacht Coatings, maintenance and boat bottom painting. Royale Palm Marina is proud to offer a full maintenance and painting service boat yard facility. Our high quality painting department specializes in Awlgrip Yacht Coatings, refits, and bottom painting for both power and sail vessels. Our in water service can accommodate yachts up to 145 feet and our berthing slips can accommodate boats from 40 feet to 145 feet. Royale Palm Marina’s complete yacht repairs boatyard.